The study aims to determine whether 8 weeks of antibiotics is non-inferior to 12 weeks in patients with acute deep spinal implant infection (SII). In the retrospective study of all SII cases (2009–2016), patients aged ≥ 15 years with microbiologically confirmed SII treated with debridement and implant retention were included. 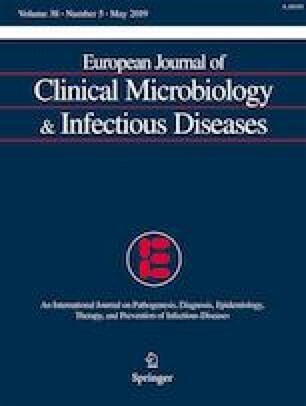 Whenever possible, tailored antibiotic treatment was used: rifampin/linezolid in gram-positive and quinolones in gram-negative infection. Patients were divided into short treatment course (8 weeks, ST group) and extended treatment (12 weeks, ET group). Primary outcome measure was percentage of cures at 1-year follow-up. One-hundred-twenty-four patients considered, 48 excluded based on the above criteria, leaving 76 patients, 28 ST and 48 ET. There were no differences in patient age, comorbidities, underlying pathologies, infection location, or surgery characteristics between groups. Surgery-to-debridement time was similar (18.5-day ST vs. 19-day ET; P = 0.96). Sixteen SII cases (21.1%) occurred with bloodstream infection. Pathogens found were Enterobacteriaceae (35, 46.1%), Staphylococcus aureus (29, 38.2%), coagulase-negative staphylococci (12, 15.8%), Pseudomonas aeruginosa (12, 15.8%), and Enterococcus faecalis (7, 9.2%). Twenty seven (35.5%) had polymicrobial infection. E. faecalis was more frequent in the ST group (7, 25% vs. 0; P < 0.001), and P. aeruginosa in ET (1, 3.6% vs. 11, 22.9%; P = 0.05). Five patients died of causes unrelated to SII. At 1-year follow-up, cure rates (21/26 ST, 80.8% vs. 39/45 ET, 86.7%; P = 0.52) and recurrences (2/26, 7.7% vs. 2/45, 4.4%; P = 0.62) were similar. Eight-week antimicrobial courses were not inferior to 12 weeks in patients with acute deep SII treated with prompt debridement, proper wound healing, and optimized antibiotics. We thank Celine Cavallo for the English language support. This work was supported by Plan Nacional de I + D + i 2013–2016 and Instituto de Salud Carlos III, Subdirección General de Redes y Centros de Investigación cooperativa, Ministerio de Economía, Industria y Competitividad, Spanish Network for Research in Infectious Diseases (REIPI RD16/0016/0003)—cofinanced by European Development Regional Fund “A way to achieve Europe,” Operative program Intelligent Growth 2014–2020.